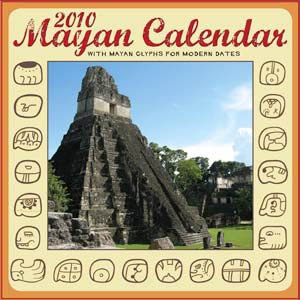 I haven't posted much about the Maya Calendar since I began this blog, but in case you are looking for a decent calendar which celebrates Maya imagery and the Tzolk'in this 2010 Mayan Calendar is the calendar to buy. The website also has plenty of authentic information about the Tzolk'in and other aspects of Maya calendar systems compiled by a Dr. Ed Barnhart, a researcher currently working in Mesoamerica on behalf of the Maya Exploration Center, a non-profit research and education center. I bought last year's calendar and thoroughly enjoyed its combination of Maya symbolism and clear, bright photography. This is an excellent calendar to buy even if you are not interested in following the current Maya dates, because they leave plenty of room to write on the calendar should you need that. All the same, this calendar uses the commonly accepted correlation between the Maya Calendar to present time otherwise known as the "Goodman, Martinez, Thompson" correlation (GMT correlation). The images for each month focus mostly on Classic Maya architecture, but also include pottery images in high detail. I've been anticipating this week with some trepidation in light of my visit to the Emergency room last January. My rational mind insists there is little to be concerned about. After all, the doctors have all shook their heads in wonder and attributed my experience to little more than unintentional overindulgence. But I can't discount the astrology of the moment. 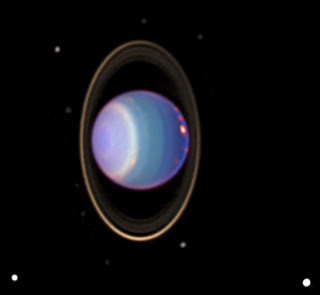 Today marks the central opposition of Saturn with Uranus and the blogs across the astrology blogosphere are filled with meaning and wisdom about this unique configuration. All the same, this clamor for understanding leaves me feeling a little empty and world weary. It has not been my intention to use this blog as a political soapbox, but my natal chart echos the United States Sibley chart which is often used for analyzing astrology for the US. So I'm not surprised my ambivalence is also echoed by a majority of people in this nation who simply want to weather this period of economic restriction with a modicum of dignity while preserving the structure of their lives in the midst of a health care revolution. I have little faith in the leaders who emotionally shout and rail against those who call for consensus and compromise. While I have benefited from the current Status Quo and I am grateful I qualified, charity is not a safety net for our nation. It is only a stop-gap for the few lucky people without insurance who have the "good sense" to become sick at the beginning of the year. When the donations run out, the uninsured, including me, become the burden of a seemingly unsympathetic government. I don't really have any empowering insight into this opposition. It is far too easy to look deeply for meaning and become lost in the potential for universal health care, while overlooking reality: a large percentage of our country's population have poor or no access to common health care. I have to remind myself that Uranus in Pisces is emotional and adjusting while Saturn in Virgo is physical and flexible. It is quite clear to me which will win out in the end, but as with all astrology, what remains important is what you are doing with your time now. I'm going to spend some "me" time in my garden. Quantum Mechanics suggests that we are made up of nothing more than tightly packed particles of energy and that reality is nothing more than the gradual expansion and transfer of that energy throughout our immediate universe. How do we turn that into meaningful truth? Through belief in self and understanding of how we effect and can help one another. This idea includes and encompasses all human systems of thought, so there is no hierarchy or dominance of one being over another. God is omnipresence and permeates all life and existence. Tao is the constant exchange of light energy and dark energy which life emerges from. Morality and ethics develop out of values developed through communication and recognition of mutual goals. Compassion for oneself and thus all humanity is the highest value one can achieve. A short time ago I jotted down several ideas that had been buzzing around my head about my interest in astrology. These aren't very concrete, so bear with me. The world is as it's supposed to be. This wouldn't be obvious to the casual observer. Too often if we are feeling unsatisfied with our lives or perceiving the world as full of suffering, it is difficult to see that this is no different than when our mood is happy and light. The potential for dissatisfaction and suffering is just as prevalent when we are unhappy as it is when we are happy. Astrology shows that there is always an overall general influence to any situation and the more specific you get, the more you realize that this influence is constantly changing. So there is never a point in time when dissatisfaction or suffering is the same, it is either getting better or getting worse. The best part is that you get to choose which. This follows the point of the previous paragraph so perhaps it doesn't need more explanation. Still, it is not an obvious conclusion when relating with astrology. One of the first practices of astrology is to look at a natal chart and compare the information contained within as if it was a moment cast in concrete. But the name "natal" tells you exactly what that point in time represents: nativity or a beginning point. Every moment from that point to the present represents your life, not simply what was percieved at the beginning. A natal chart is a tool for reflection on your present self and does not determine anything more than your potential at birth. I think this principal is the most confusing aspect to grasp about astrology. The question that comes up almost immediately is how can a point in the past represent my whole life? The answer isn't a simple yes or no, because astrological information pivots on the interpretation of the moment, not the fact of the moment itself. This division between fact and interpretation is a conversation humans have been engaged for millenia and could even be said to be the essence of philosophy.